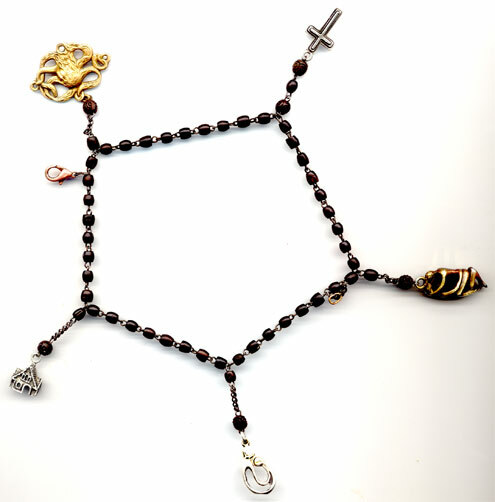 He had the ingenious idea to make it with a rosary so that I can use it to pray, too. I can use to pray that God will help me to be better at all of these rolls! Of course, I don’t pray Hail Marys. Chris suggested that I pray breath prayers*. Adele Ahlberg Calhoun wrote about breath prayers on pages 204-206 of her book, Spiritual Disciplines Handbook: Practices that Transform Us. It was one of the books Chris had to read for a masters class. To pray a breath prayer you pick a name for God like Abba and then you say a one line desire of your heart. So, I would say “Abba” (as I breathe in) and pray, “Help me to be a good a mother as you are a Father to me” (as I exhale). I haven’t actually done this yet. Chris suggested I pick a different name of God for each charm and I am just starting to look into it and decide. 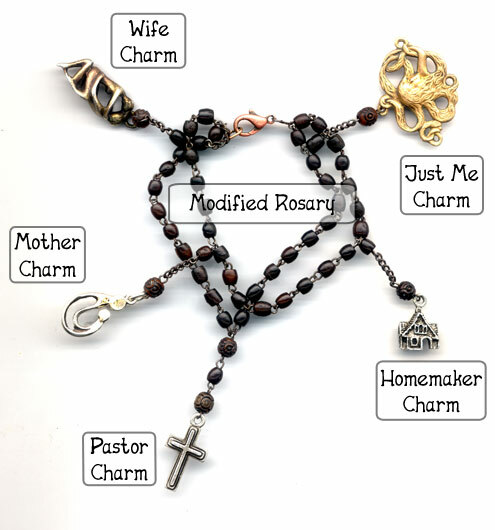 The rosary had to be modified to fit my wrist as a bracelet, so there is one less bead for each decade (the ten beads between each of the charms. That just means that I have to count the first bead that hangs down with the charm as both 10 of the decade before it and 1 of the decade after it. I hope that explanation is clearer than it seems to me. On the beads that are right above each of the charms, I pray the Lord’s Prayer. The second picture shows how the bracelet looks when it is off. After I decide on my breath prayers I may share those with you, too. But, you must admit that he did a pretty good job with my present, huh? Way to go hubby! *Disclaimer: This is by no means how you should always pray. This is a prayer that helps you to continually pray throughout the day when you cannot stop what you are doing. You can still pray while doing other things.